Yesterday we checked another item off our Summer Fun Bucket List and made Tie Dye T-Shirts. But because funds are a little tight we had to improvise!!! Not sure if you have seen the prices on dye lately but a bottle/box can range anywhere from $3-$5. And after you buy a few colors you're looking at around $20 or more. Well since tie dying t-shirts wasn't a priority but something we really wanted to do this Summer I decided to start searching for alternatives to the store bought dyes. And I found that there are several alternatives!! We decided to give the tissue paper and crepe paper streamer option a try since we already had plenty on hand from parties and presents we have received/given. 1. Soak your white t-shirt in water and then lay it out on a protected surface. 2. Tear or cut up pieces of tissue paper/crepe paper streamers and lay them down onto the t-shirt. Have fun with this part. You can make patterns or even pictures. We went for the traditional tie dye look. After laying down a piece or two spray the tissue paper/crepe paper streamers with white vinegar using a squirt bottle. 3. After you have your t-shirt covered the way you want with the tissue paper/crepe paper streamers soak the t-shirt, tissue paper/crepe paper streamers with white vinegar again. Then let it dry. Ours were outside in the sun and took a few hours to dry. 4. After your shirt is dry remove the tissue paper/crepe paper streamers. You should hopefully have a beautifully colored shirt. Next place the t-shirt in the clothes dryer on high heat to set the dye. 5. Next if you wish, decorate your t-shirt using Rose Art Fabric Paint. I highly recommend these gorgeous glittery paints. They are easy to use, easy to write with and dry very quickly. They also come in 6 Different Colors: White, Light Purple, Blue, Turquoise, Yellow and Pink. 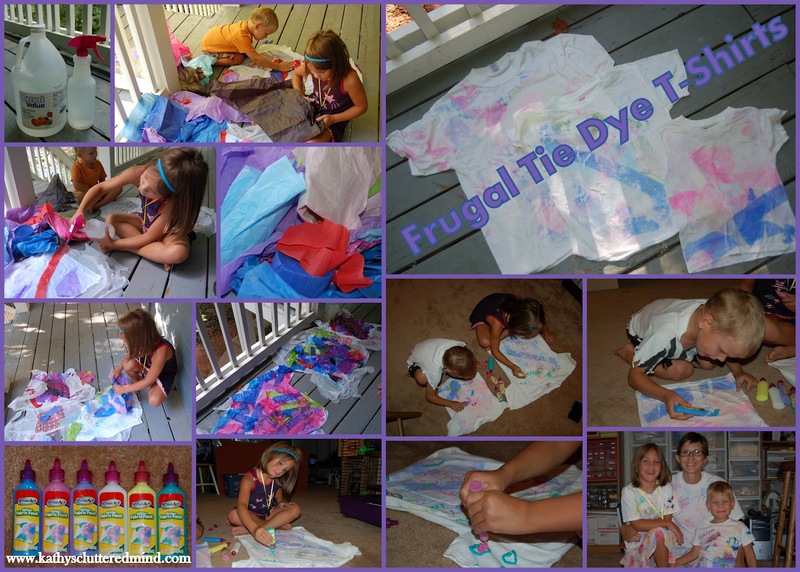 The kids had lots of fun adding sparkle to their tie dye shirts. We all wrote our names on our t-shirts mine says Mommy. Gwyn drew pretty balloons on hers. And Rowyn and I made lots of squiggles on ours. To buy these Rose Art products visit your local Walmart, Joann's, Target, etc or visit my Rose Art Amazon store. 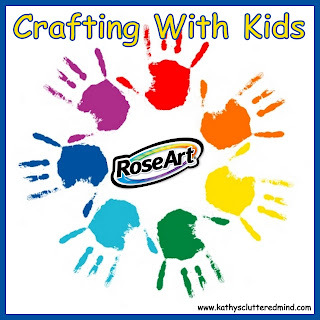 Stay tuned for more great Rose Art crafting fun.....and reviews about their new line of educational products. Read more about the LeapFrog and MEGA Brand partnership. 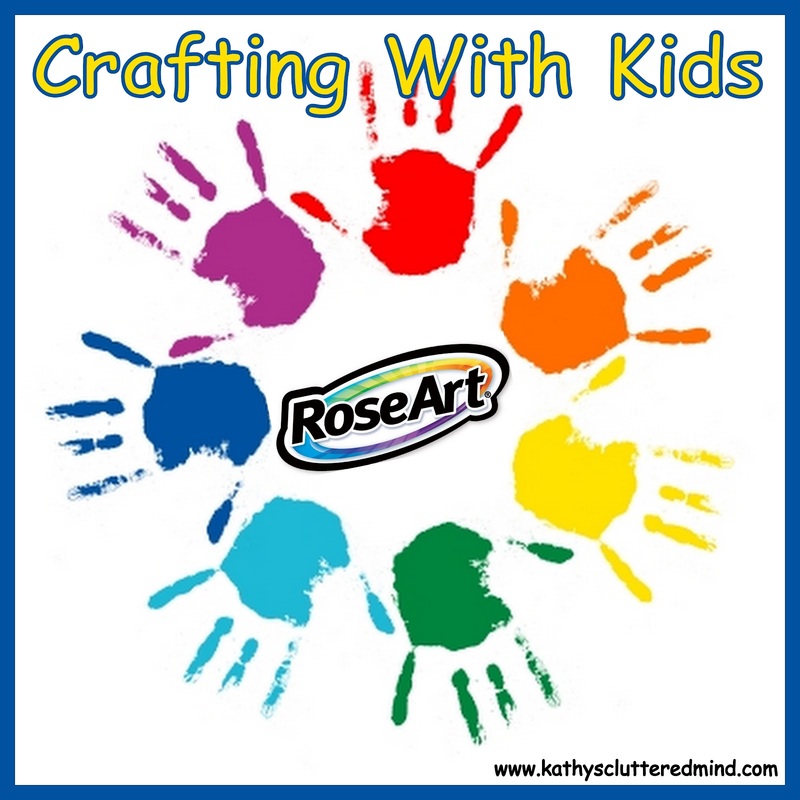 *Disclaimer - Rose Art (Mega Brand) supplies us with lots of wonderful products in return for honest reviews and craft project how to's. I was not compensated for my review and all opinions are our own! Many of the links found on my side bars and in my blog posts are affiliate links. As a result, I might get paid money and I will most likely spend the money on homeschool supplies.